Is this National promising to build more prisons or prison capacity? If it is, why don't they spell it out. Can nobody speak plain English any more? If it is, it's the first commendable policy I have heard from them. A record number of active-duty soldiers killed themselves last year, according to The Washington Post. The paper cites an internal Army study that shows 121 soldiers committed suicide in 2007. That's a 20% increase over the prior year, the Post says. "The conflicts in Iraq and Afghanistan have placed severe stress on the Army, caused in part by repeated and lengthened deployments," the paper reports. "Historically, suicide rates tend to decrease when soldiers are in conflicts overseas, but that trend has reversed in recent years. From a suicide rate of 9.8 per 100,000 active-duty soldiers in 2001 -- the lowest rate on record -- the Army reached an all-time high of 17.5 suicides per 100,000 active-duty soldiers in 2006." The three-year moving average age-standardised rate of suicide for Maori was 17.9 deaths per 100,000 population in 2003–2005....The three-year moving average age-standardised rate of suicide for Maori males was 28.4 deaths per 100,000 population in 2003–2005, compared with the rate for non-Maori males of 18.4 per 100,000 population, which was significantly lower. You are more likely to kill yourself if you are Maori, particularly a Maori male, living in New Zealand than if you are on active service in Iraq. One of the reasons for the increasing ferocity of youth crime is the breakdown of the family and the dysfunction of relationships within what is left of the family. The most obvious changed aspect of today's families is the absent father. That alone does not produce delinquent youths but a lack of a strong male role model starts a child off in a position of disadvantage. Some children have fathers who they would probably be better off without, and the same can be said for mothers. But the sort of family that is best placed to raise a secure and self-respecting teenager has been steadily eroded by welfare benefits that accrue to broken or incomplete families. During the 40s, 50s and 60s youth crime was much more infrequent and less violent than it is today. Although many teenagers then had lost a father to war or desertion, they were not raised on a diet of welfare or fed an entitlement mentality. Their mothers received some assistance but many worked and instilled the need to work in their children. In the 70s this began to change. Babies began being born to women who had no intention of raising them with a partner. Women who, if they thought about it, believed they could do just as good a job as the two parent, working family so long as the government paid them to stay home and parent. Many did. But a growing group did not. As the negative consequences for unmarried birth disappeared the casual approach to childbearing grew. As more focus fell on ex-nuptial births, surveys revealed these children were more at risk of being abused or neglected. Abused and neglected children have far greater potential for becoming criminals. Unmarried births now account for 45 percent of all births. Some of these babies will be born into enduring de facto relationships but those circumstances are reasonably rare. Today's youth workers say that the solution to youth crime is for children to have a quality relationship with an adult or adults. But which relationship is the most predominant in a child's life? The one he has with his mother and/or father, which begins at birth. The chances of that relationship being strong or even existing are reduced by casual childbearing. And casual childbearing is directly related to the elimination of negative consequences. In fact, receiving a steady and guaranteed income from the government is seen as a positive consequence. Add to this that very young maternal age is shown to further increase a child's risk of becoming a criminal. Yet an income which surpasses the minimum wage is paid to girls as young as 16 who decide to continue with a pregnancy. Half of those young mothers aged 16 and 17 and receiving welfare are typically Maori. Half of our prison population is Maori. This is more than a coincidence but a blind eye is effectively turned by government who make no attempt to research an association. Because the stream of teenage and un-partnered mothers going onto benefits long-term is steady, even growing slightly, New Zealand can expect the sort of youth violence we are seeing now to continue unabated. In that respect the new plans to fight youth crime are too little too late. Our leaders need to start talking about the prevention of casual childbearing and the removal of those incentives which cause it. Anything else is avoidance of the real issue and political expediency. Around 1.2 people out of every hundred thousand are homicide victims. That is a significant drop from around 1.5 per hundred thousand in the early eighties. In the late eighties, the rate of homicides soared to 2.0 out of every 100,000 population. So New Zealand is a lot less violent today than it was then. Wouldn't it be better to measure how violent New Zealand is by convictions for violence? Even that measure is inadequate because first the violence has to be reported and then, successfully prosecuted. 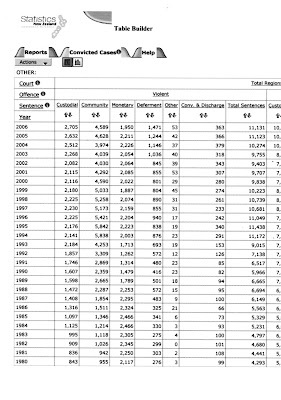 But below are the violent convictions from 1980 to 2006. On that basis New Zealand is more violent now than in the late eighties. So why would Jim seek to persuade us that NZ was more violent in the 80s? Violent death rates rose very steeply in the late eighties, stayed high in the nineties and have since begun to come down. What else was going on that could explain the crime wave? The pattern of violence follows exactly a pattern of economic devastation. When unemployment rocketed and families were hammered by hard economic times, offending rose dramatically. But Jim, the pattern of violence, when charted by convictions does not follow your "pattern of economic devastation". How do you explain that? NZ has, according to you "neared full employment", yet violence is still widespread - and that's just the violence we know about. You know what Jim? We haven't neared full employment at all. And that is why we still have intolerable crime. We have high unemployment hidden by reliance on benefits other than the dole. We have violent youths coming out of workless, dysfunctional homes which turn on the DPB. We have violent youths coming out of gang homes whose staple diet is welfare. The correlation between benefit dependence and crime is stronger than the one between unemployment and crime. Give up on blaming the economic reforms and start looking at the individuals who will not help themselves or their children. Labour's big bribe for 2008? I originally wrote this post in June last year but I never hit the publish button. Some conceited streak in me must have worried about giving Labour ideas. It occurs to me that Labour has reintroduced the 1945 Family Benefit (abolished in 1990) with its Working For families tax credits. The really popular aspect of the family benefit was its capitalisation potential, also the most popular campaign issue of 1957. Walter Nash hoped capitalisation would boost home ownership and the birthrate. All of a child's family benefit could be paid in a lump sum. So what would be a really popular campaign promise from Labour next year? To allow parents to have family tax credits paid as a lump sum to be used to buy their first home. I wouldn't put it past them. Mr Anderton also said families should be allowed to capitalise their family support on their first child - such as Working for Families and in-work payments - for a deposit on a house, saying he knew it could work "because that's how I bought my house". It's a goer. And I predict National will say 'me too'. I am genuinely pleased Key focussed on young, problem people although I think Youth Court Judge Andrew Becroft's provided estimate of 1,000 hardened types is a self-deception. This speech, however, hails the era of the big-state conservatives. Yes, it is full of references to private providers, but the funding comes from the taxpayer. It is replete with commitment to new funding. The Youth Guarantee (free education for 16-17 year-olds outside of state schools), specific catering for teenage parents (one assumes on top of the current provision for around 600), drug and alcohol rehab programmes, mentoring programmes, more youth residential facilities (necessary if sentences are to be lengthened - we only have 3 currently), supervision with activity, Fresh Start programmes to last up to one year using mentors, social workers (of which there is a shortage), the army and others. Now it may be that the big-spending conservative is more effective than the big-spending left liberal. We shall see. But people wanting less government (more has never been shown to improve matters) will not receive this speech with joyful enthusiasm. The move to allow the Youth Court to deal with 12 and 13 year-olds (instead of the Family Court) is an improvement. But the power to issue parenting orders - send parents to parenting courses - is worthless. Why? Because the penalty for not complying is community work or fines. Many of these parents will have already shown a finger to both for other misdemeanours. These troublesome kids are more often than not children of criminals. Note, just a few minutes later Key says he is sick of hearing about young offenders who receive community based sentences but fail to comply. That behaviour isn't confined to youth. What Key is announcing here is the war on youth crime. Yet another campaign akin to the war on poverty and the war on drugs. Neither has seen a victory for the state. And I think that Clark will pull him apart on 1/ so much extra spending along with tax cuts, 2/ the fact that under National (but not under Key) the numbers of teens sitting around "filling their days with nothing but Playstation and TV soaps" was far greater and 3/ on paper, Labour have monstered unemployment, including youth, while National failed. I don't necessarily agree with these arguments but they are some I predict she will use. But, I am going to give Key a B for effort. He is clearly listening to people who work with these young people. And no political party, no advocacy group and no individual can supply a perfect or painless solution. Here is an excerpt from a speech ACC Minister Maryan Street delivered on Saturday. I believe there is a legitimate place for the use of law as a lever for achieving better health outcomes, but there also have to be boundaries - and the truth is that we usually decide where those boundaries lie on a case-by-case basis. And when I say “we” I mean the Government. I believe Parliament is the most appropriate place for these types of decisions to be made. With all due respect to the lawyers, officials and academics in the room, who may well make more rational or scientific decisions than we politicians, it is appropriate that politicians, who are ultimately accountable to the people, decide the extent to which the state will limit individual decision-making. I should also say that I do not believe these types of decisions can be appropriately made by “the market”. For example, the makers of “fast food”, tobacco or alcohol will say that people should have the right to buy their products wherever and whenever they choose. Sometimes the freedom to do so is escalated into “the democratic freedoms for which wars were fought”. The problem is that right now we are seeing whole communities suffering unacceptable levels of obesity, diabetes, lung cancer and other preventable diseases. They were given the freedom to choose but not the information to make an informed choice. So I believe Government has a vital role in ensuring people have the information they need to make informed choices. How should this reality be balanced against the individual freedom argument? The “individual freedom” argument does not address the issue of collective consequences. When a young person chooses to drink and drive and consequently injures or kills someone else, who pays? When someone chooses to smoke and develops lung cancer, who pays? The answer is invariably the rest of us. And I’m not just talking about the financial cost to organisations like my own ACC or the public health system but also the impact on the families, communities and employers of the people involved. So for generations now, governments have made decisions to use the law to limit individual freedoms and thus reduce the collective consequences. I take issue with that last sentence. The law has indeed been used to limit individual freedoms but that hasn't reduced collective consequences. Collective consequences increase under collectivism. That is because there is no incentive to avoid risky behaviour when someone else will pay. For instance why do we have over 130,000 people on sickness and invalid benefits when just thirty years ago there were only around 18,000? And it isn't to do with the size of the population. It is partly to do an expectation that the state will support people regardless of the reason for their incapacity. It wasn't always that way and in the past people had to exercise a good deal more personal responsibility in their actions. With all due respect to the lawyers, officials and academics in the room, who may well make more rational or scientific decisions than we politicians, it is appropriate that politicians, who are ultimately accountable to the people, decide the extent to which the state will limit individual decision-making. This is a worrying admission. According to Ms Street MPs do not make the most rational or scientific decisions. Nevertheless they are still the best people to do so because we voted for them. I didn't vote for you Maryan. And I am sure that you do not feel any need to be accountable to me. Ultimately you will be accountable to your own conscience and ideas. Not a prospect I relish. Imagine waking up one day to find that you have become a cinema. 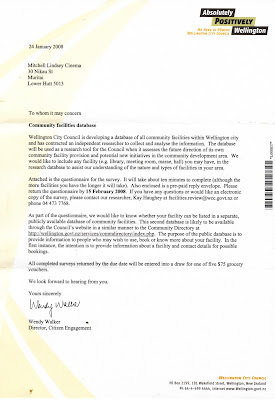 On Saturday I received a letter from the Wellington City Council addressed to Lindsey Mitchell Cinema. They are developing a database of all the community facilities within Wellington and have sent me a 4 double-sided page survey to assist in that endeavour. So I googled "Lindsey Mitchell Cinema nz"
Here is the page I found. I scrolled down to discover I am indeed a cinema and when clicked on the link was given a graphic illustration of how to find me and a phone number to find out what I am currently showing. I have no idea how this has come about. I am listed as "Mitchell Lindsay" in the Yellow Pages as an artist. But that is a far cry from being a cinema - "Muritai Cinemas" at that. Should I be pissed off about this? Who is making money from a site with bogus listings? Any thoughts? The Right has found a heavy club to beat the government with: a referendum on smacking at the next election. This is a brilliant ploy by the religious extremists of Family First. It will gather not only libertarians, Act voters and other motley fanatics of that kind, but many decent and ordinary people. It is as though the Brethren had found a cause that appealed to the mainstream. The political and social effects are likely to be large and wholly malign. I voted ACT at the last election. I know I am not particularly ordinary (inasmuch as my ideas are not reflected by the majority) but I am decent. It is this sort of labelling from the 'Left' (which is presumably where the editor's sympathies lie) that make debates turn nasty. And I have to say, in my relatively short time involved in politics, those on the Left are a lot better at it. That is because thinking people can defend their ideas without resorting to personally maligning detractors and there would appear to be fewer of them amongst the collectivists. And look how little real tolerance there is among the liberal left. Freedom of belief has shut up shop. I am a non-believer but passionate about the right of others to have and hold and cherish their faith. Yet the secular Left increasingly characterise people with religious belief as evil fanaticists. Family First was an active player at the last election, and it has found an ideal vehicle to drive through the next one. But do you really want to get in the passenger seat with them? Over the page from this mean piece is a full page advert placed by none other than Family First. The paper will have an editorial policy and an advertising policy and no doubt, never the twain shall meet. Perhaps this column is the editor's lash back at prioritised commercial considerations. Whatever it is, I've had enough. Unlike Family First I am not willing to pay people to insult me. Please cancel our subscription to your newspaper today. It is not without regret that I choose this course of action. News is important to me. Ideas are important to me. But today's editorial, which infers ACT voters, libertarians and people of faith are not "decent" people, is a more extreme view than those you profess to warn against.